Superheroes come in many shapes and sizes. In the movies and the comics, they’re most often big and strong, with bulging biceps and superpowers unlike anything we earthlings have ever seen. In real life, however, superheroes often look much different, their powers subtler. This is what makes 6-year-old Seth Fabry’s story so special. Seth has one of the rarer forms of leukemia, or cancer of the blood. Early in his treatment the prognosis was not good; multiple complications prompted challenging surgeries and lengthened his overall recovery time. 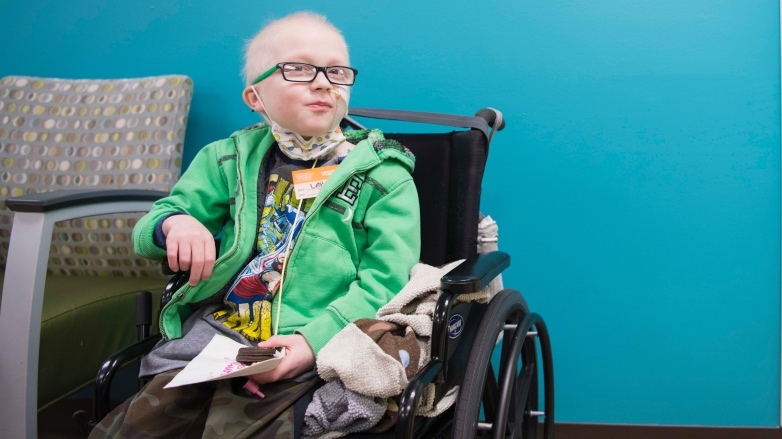 But with an otherworldly amount of fight and months of help from doctors and caregivers at Children’s Hospital Los Angeles, Seth has managed to battle back against the disease, turning the odds in his favor. Seth’s fight against leukemia began on July 14, 2017. Lisa had taken him to his regular pediatrician in their hometown of Simi Valley for what she thought was simply a virus. Blood-test results prompted the doctor to suspect leukemia, and she told Lisa to take Seth and drive immediately to CHLA—about an hour away. Lisa says she doesn’t remember anything about the journey. “Those first few hours are a blur of nurses and doctors, but I remember they were all compassionate, respectful, and willing to sit with us for as long as it took to answer any questions we had,” she says. 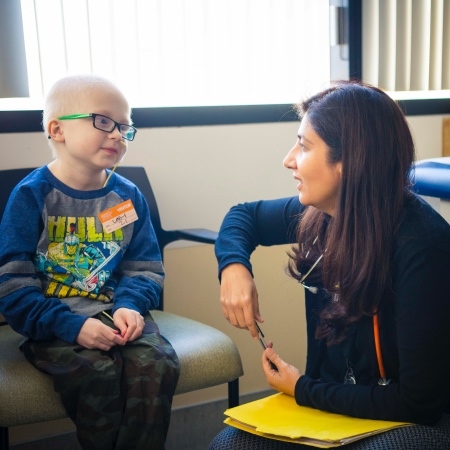 One of the doctors who met with the Fabry family on that first day was Deepa Bhojwani, MD, director of the Leukemia and Lymphoma Program at CHLA’s Children’s Center for Cancer and Blood Diseases. Bhojwani, who is also associate professor of clinical pediatrics at the Keck School of Medicine of the University of Southern California (USC), has been Seth’s doctor ever since. Bhojwani describes Seth’s leukemia as aggressive, and notes that the situation has gotten more difficult since his initial diagnosis. At first, doctors thought Seth had what is known as “standard-risk” leukemia—one that has a 95 percent cure rate. Quickly, however, Bhojwani and her colleagues revised the diagnosis to something much more rare: Philadelphia chromosome positive acute lymphoblastic leukemia, or PH+. This second diagnosis, which accounts for only 5 percent of all cases of leukemia, put Seth in a category with an 80 percent cure rate. It also meant his chemotherapy treatment would be very aggressive and more difficult to power through. As Seth began treatment, the cancer proved to be only one of a series of problems the boy with the little black eyeglasses would face. Following his first few days of chemotherapy, Seth developed an extremely serious fungal infection, and CHLA doctors had to remove roughly one-third of his intestines. Following that surgery, Seth spent time in a medically induced coma. Doctors had to put Seth on breathing and feeding tubes, as well as a colostomy bag. These complications forced Bhojwani to alter the amount of chemotherapy she administered so it wouldn’t exacerbate the situation. Finally, because Seth spent so much time laid up in bed, he had to endure three months of physical therapy to learn how to walk again. Somehow, through it all, Super Seth remained positive. 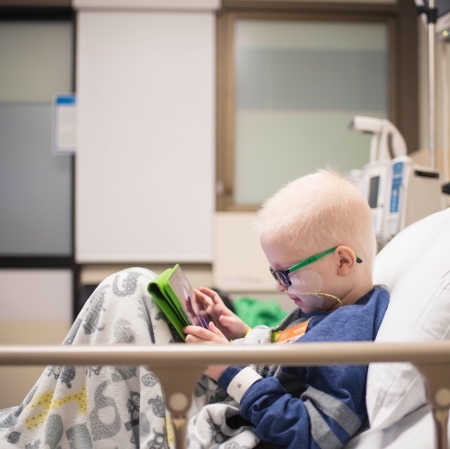 During all of these complications, the Fabry family worked with a number of different departments within CHLA, including Hematology-Oncology, Infectious Diseases, Surgery, Intensive Care, Rehabilitation Medicine, and Nutrition. According to Bhojwani, the coordination among the different areas played a huge role in Seth’s speedy recovery. Coincidentally, the Fabry family had established a connection with CHLA long before Seth ever became ill. Jimmy, Seth’s dad, works in construction, and was one of the project managers who oversaw the building of the hospital’s Marion and John E. Anderson Pavilion, completed in 2011. Every day for six years, Jimmy reported to work at CHLA, toiling on the new building and making sure other contractors did their jobs. Lisa remembers her husband would regale her with stories of children and families he met on the job. “He would come home sad about all the children he saw during the day and amazed at the strength he saw in the faces of the parents and nurses,” she says. This connection serendipitously stretched into other parts of the Fabry family’s life. When the family bought a new house in Simi Valley, they bonded with their real estate agent, Larry Watson, when he told them he donated part of every sale to CHLA, and also gave blood at CHLA multiple times a year. Fittingly, when Lisa and Jimmy Fabry turned to CHLA to treat their son, they called their friend to thank him for all the blood he had donated over the years. The Fabrys acknowledge others who have had a huge impact on their experience at CHLA: Bhojwani, for one, and the nurses. Even Seth’s teachers have helped make his journey easier. Technically this year he is in first grade, at a school where two instructors are tasked to teach the class in tandem. Every week, the teachers take turns coming to CHLA or the Fabry family home to tutor Seth for an hour or two, helping him learn the material on their own time. The educators don’t get paid extra for this effort; they’re simply doing it because it’s the right thing to do. Looking forward, the prognosis for Seth is cautiously optimistic. His cancer is responding favorably to treatment. The young man also is in phase four of a five-phase plan of intensive chemotherapy. Following the intensive phases, Seth will enter the maintenance phase, which is expected to take the better part of three years. This phase will include continued chemotherapy and monthly visits, but also will enable him to go back to school for second grade. Seth continues to need the feeding tube and colostomy bag, though these will be removed in the future as he becomes stronger. Bhojwani is careful never to look too far ahead; instead, she readies Seth and his family only for the procedures directly in front of them, to keep them focused on the here and now. As for Seth, he has learned to celebrate the little things—time with his 9-year-old brother and his friends, watching videos on his iPad, and cheering on his beloved L.A. Kings with his mom and dad, who are die-hard fans. This why Seth was downright giddy when he got the chance through CHLA to meet some of his favorite players and attend a practice. It’s also why he and his family were so excited to attend a game at Staples Center as VIPs. To help kids just like Seth, consider making a donation to Children's Hospital Los Angeles. Visit CHLA.org/Donate.